A glimpse of stocking was rather shocking! A glimpse of stocking was rather shocking, but now today — oh, heaven knows — anything goes! 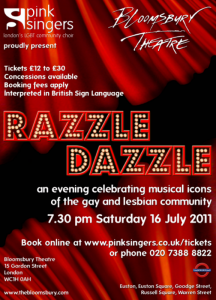 Today anything goes, but come Saturday everything will be all a-go at the Pink Singers summer concert Razzle Dazzle. Over the last five months we’ve been putting together our tribute to the musical icons of the LGBT community. You’ve seen us in rehearsal, learned which songs which inspire us, and heard why this concert will be different from any other you’ve seen from the Pink Singers before. The luckier ones out there have even seen a preview of what’s to come. Now all we need is you! Be sure to get your ticket to the show on Saturday, and remember, your ticket also gives you access to our dazzling after-show party. See you on Saturday! Previous Previous post: The Pinkies’ dazzling post-show party!